What, exactly, is knowledge of music? And what does it tell us about humanistic knowledge in general? The Thought of Music grapples directly with these fundamental questions—questions especially compelling at a time when humanistic knowledge is enmeshed in debates about its character and future. 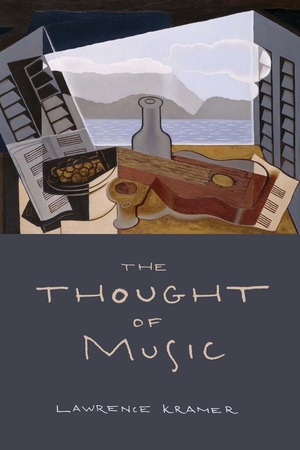 In this third volume in a trilogy on musical understanding that includes Interpreting Music and Expression and Truth, Lawrence Kramer seeks answers in both thought about music and thought in music—thinking in tones. He skillfully assesses musical scholarship in the aftermath of critical musicology and musical hermeneutics and in view of more recent concerns with embodiment, affect, and performance. This authoritative and timely work challenges the prevailing conceptions of every topic it addresses: language, context, and culture; pleasure and performance; and, through music, the foundations of understanding in the humanities. The publisher gratefully acknowledges the Joseph Kerman Endowment of the American Musicological Society, funded in part by the National Endowment for the Humanities and the Andrew W. Mellon Foundation. Lawrence Kramer is Distinguished Professor of English and Music at Fordham University and the author of numerous books. His trilogy on musical understanding includes Interpreting Music, Expression and Truth, and The Thought of Music. He is also a prizewinning composer. "Kramer has been hugely successful in creating a community of formalist and hermeneutic analytical discourse that has inspired a new generation of thinkers to question music’s inherent meaning and value in contemporary society. . . a hugely important and timely work that should no doubt become the focus of much future work and pedagogy."